In this interview Barry S. Goldberg gives advice on collecting antique American made pocket watches. Barry is based in Melrose, Massachusetts, and his site is a member of our Hall of Fame. Collectors Weekly: How many watches do you have in your collection? Goldberg: I’d have to count, but I’d say about 40 or 50. Over the years I’ve had hundreds, but over time I’ve traded up to get better examples. When I started collecting, I had in my mind a growing list of the types of watches I wanted to buy, representative samples of various types of watches. I’d go to Brimfield and come home with 10 watches. There would be two I wanted to keep, and eight that were similar to ones I already had or were not in as good condition. So I’d sell those to help me buy another one I wanted. If I saw a better watch, I’d buy that watch and try to sell the lesser examples of it. That happens with Railroad watches, if I have a 21 jewel Waltham Vanguard and I have an opportunity to buy a 23 jewel Waltham Vanguard, I might sell the 21 jewel to help pay for the 23 jewel. Collectors Weekly: What’s a railroad watch? Goldberg: They were built to specifications required for use on the railroad, including the number of jewels and the number of adjustments. Adjustments means the watch has been specially calibrated to keep constant time regardless of how it is held, adjusted to work in the vertical position, the horizontal position, the left, right, upside down position. Jewels are basically bearings on the various gears. A watch with no jewels is metal grinding on metal and pretty soon will stop. They’re real jewels like rubies, diamonds, and sapphires – the shaft of each wheel goes through this little donut shaped jewel to reduce the friction. On a very high-grade watch, every single wheel or gear would have a jewel, one on the front and one on the back and what they call cap jewels to prevent it from going up or down. Lower-grade watches would only have them on the gears that are moving the fastest and a really crappy watch would only have one or two jewels or maybe none. These are not gem quality jewels, no one would take them out of a watch and try to sell them as jewelry, they are more industrial type jewels because the ruby, sapphire, and diamond are so hard, they make very good bearings because they don’t wear. Collectors Weekly: How do you keep your watches in good condition? Goldberg: I bring them in for a good cleaning so they can run. I have a friend who has a watch shop, and he does that for me. I do minor repair work, I’ve replaced broken glass crystals on occasion, but for the most part I try not to fiddle with them too much. They’re fragile and if you spend too much time taking them apart, there is the danger that you won’t be able to get them back together. Collectors Weekly: Why do you like going to shows and flea markets? Goldberg: You get to hold the item in your hand and talk to the seller instead of just looking at a picture and hoping it’s real. The downside is that you can wander around hours and never find anything you’re looking for, whereas online you can do a search for pocket watches and they are displayed in front of you. So if I have time, I prefer to buy at a show. The other thing about buying at shows is you really need to know what you’re looking at, be prepared, because you don’t have the luxury of thinking something is interesting, going to do some research, and coming back the next day to the listing. So you can make mistakes and think that something looks interesting and buy it just in case, and get home and find out it’s not worthwhile. Collectors Weekly: How do you do your research? Goldberg: I primarily use a variety of books. There’s a kind of watch collectors bible by Shougart called The Complete Price Guide to Watches. There’s also a whole series of books put out by a company called Heart of America Press, the owner recently passed away, but he had a good variety of watch books. Collectors Weekly: Is there a certain date of manufacture you won’t collect past? Goldberg: I don’t have a hard and fast date, but really any watch made after the 1930s isn’t going to interest me. Even the later Walthams made in the 1940s, 1950s, at that point they were really cutting the corners and they just don’t appeal to me. One thing I loved about the old watches is the workmanship and as they got away from that they became less interesting. Collectors Weekly: What parts of the pocket watch most attracted you at first? Goldberg: The mechanisms. I was really draw to the key wound watches at first. Just the history and the fact that it’s such a bygone time, using a little key to wind your watch and watching the mechanisms move back and forth. The other parts of the watch are nice, I really enjoy a finely made case and a fancy dial, but to be honest it really is the mechanisms or what we call the movements of the watch that inspire me. If you look on my watch pages you’ll see that I always include the movements of the watch. Collectors Weekly: What are the cases typically made out of? Goldberg: Different metals, silver, gold, a lot of them are gold-filled, which is two very thin sheets of gold on the outside around a thicker layer of brass. You have watches that have cases made from a wide variety of silver color material, with a colorful trade names like silveride, usually nickel based. Gold watches are appealing to collectors but the value really has to do with what was appropriate to the watch at the time. If the particular watch was only ever offered in a nickel case, then putting it in a gold case isn’t necessarily going to make it a better watch. Collectors Weekly: What’s a two-tone movement? Goldberg: It’s a way of decorating a watch movement. Sometimes it involved actually using two different colors or types of metal so you got a two-tone effect. Sometimes it was the way they acid washed the movement itself, I personally think those are some of the most beautiful. They would actually use acid to engrave and change the color of the metal plates. Collectors Weekly: I see that you made your own guide to pocket watches? Goldberg: Yes, its a 40-page book called The New Collectors Guide to Pocket Watches. People were asking me the same questions over and over, questions you really needed to understand before you started reading the big books, which assumed you already knew the basics. I had a section on my website of frequently asked questions that just kept growing and growing and people suggested that I put it into a book format. It allowed me to add some illustrations and really expand on it. The most popular questions were things like how do I set my watch? How do I open my watch? What are jewels? How can my watch be adjusted? What is a Railroad watch? Are my watches really gold or gold filled? Also, European watches have foreign words written all over them and a lot of people don’t understand that they usually have nothing to do with who made the watch, they’re general descriptions on the watch. Collectors Weekly: What about European pocket watches? Goldberg: I’ve collected European watches as well, but not as heavily. European watches tend to be very expensive in the U.S., and hard to maintain because watch makers here don’t have the expertise and knowledge to make repairs to them. The European watches weren’t mass produced, they were made by hand, so any replacement parts have to be made by hand. Whereas if a hand broke off of your Waltham or a gear was damaged, the watchmaker could reach into his drawer where he has 500 replacements and fix it for you. So I decided early on that I should focus on the American. Collectors Weekly: Do you see lots of reproduction pocket watches? Goldberg: Not as much with pocket watches as with wristwatches. What you do see is reproductions of the dials and the actual face of the watch, because they were primarily porcelain, and tended to break over the years. There’s a booming secondary market with people putting together very cheap metal dials with just laser printed paper stuck on there. Or a hand painted dial that looks like a dial from 200 years ago. People sell those and then somebody puts them on watches and tries to sell it as a 200 year old watch when in fact it’s just a 60 year old watch with a fake dial. The same thing can happen with high-end Railroad watches, which are very collectible. These are the highest-grade watches that were made by the American watch companies in the late 1800s, early 1900s. Those had very specific dials, which over time got damaged and there was a market for reproduction dials. Those Railroad watches by themselves are pretty valuable, but if they have a perfect dial and a perfect case and a perfect movement, they’ll command a much higher price. So, if people produce a reproduction dial, and again they might be selling them very innocently, the next person buys it and puts it on eBay saying it’s in mint condition, perfect all around original. The watch itself is not a reproduction, but the dial was made 10 years ago. For most collectors, if a pocket watch doesn’t have an original dial, they don’t want it. I’m less picky, and because I can never afford the best of the best, I have watches in my collection that don’t have perfect dials, or they have a little crack or chip. I still prefer that over a perfect reproduction dial, because at least I know it’s original, it’s authentic. Collectors Weekly: What advice do you have for someone just starting to collect pocket watches? Goldberg: Learn as much as you can before you spend too much money. Buy the Complete Price Guide to Watches, because that’s a really good overview of what’s out there and the prices you should be looking to pay. Join your local chapter of the NAWCC, because the best way to get experience is to talk to other collectors. I certainly wouldn’t discourage people from going out there and buying watches, but I’d say be careful and don’t try to buy the most expensive watches you can find. Until you know what you’re looking for, you can spend a lot of money on junk. Goldberg: I just think that pocket watches are a wonderful way to own a tangible piece of history. They’re something from a bygone era that isn’t made anymore and it’s amazing that something made 100 to 200 years ago can still be running after all that time. My watch has a case that says FAHYS MONARCH 14 K. The number on the case, front and back and also in the little lid that covers the movement is 800399. There are flowery designs on the front and a set of initials and on back the flowery designs with a set of buildings in the center. On the SAFETY BARREL of the movement it says Am. Watch Co. WALTHAM, MASS. and the number there is 5472432. It is 1 7/16 inch diameter, the fob has three chains with one decorated ball of 9/16″ diameter and another of 3/8″ diameter and the third has a pin that probably went through a button hole. The face is white with blue numbers and gold decorative designs, the 3 is just below the winding stem. There is a small dial with a second hand located at the “6” position. There is a slight crack in the face. Reportedly it was an engagement present given to my aunt in 1899 in Western Missouri. It runs, tho I have not figured out how to set it. I would like to know more about it, dates of manufacture of case and movement, where to look for number of jewels, value, where can I find more data about it. Thank You. hand engraved by PF Bartlett. Can you give me some idea of how old it is and worth. Have American Waltham Fahy Monarch No1 Oat April 22 1879 ser.# 5014963. Would like a guestement of value for insurance. No idea if very valuable or not. Hello. 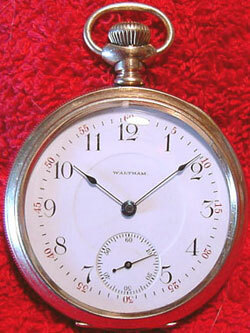 I have a few 1800’s Waltham and Hampden pocket watches. They all work great and are size 18. Really love them. How can a person tell if the case is original to the watch movement ? Cases are easily changed between movements so I don’t see how you could ever tell for sure. My understanding is that most watch companies shipped their movements to the dealers. The dealer would then fit the movement to the case of choice that the customer selected. Would I be correct ? I was also told that side winder watches (at 3 o’clock) are hunter cased and open face watches always wind at the top (12 o’clock position. But a have seen quite a few of the open faced watches that wind from the side. I assume these were changed to a different case at some time. Thanks so much. I am 76 years old and I have Delaware Railroader pocket watch that belonged to my Grandfather who worked on the railroad in West Virginia. He was killed when he was accidentally run over while removing a stone from the tracks. I have the newspaper item that reported his death. The watch has a train etched on the back. I can’t find anything on this watch anywhere. Can you tell me anything about it. Thank you. Hello, I have a watch, it is round and has hands and funny symbols on it (II I XII etc) and it also makes a strange ticking sound. Please advise maker, model, date etc. I have an old Hampden in a Duber special case. It was given to my grandmother, for what reason I don’t know. Then it was given to my mother who gave it to me. It didn’t work so I took it to a jewler where I live and he fixed the movement. This was over 40 years ago. Like any foolish young kid I carried it in the watch pocket of my jeans. Needless to say the outer covers became a little dented. The front case has the number 5694063. The back case has the same number with the Duber special anchor marking. Inside the movement cover has the same number and a “shell” like pattern on the entire surface. The movement has the number 1512191. 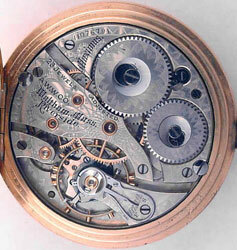 “safety pinion” is engraved on the movement along with a large scroled name of “Gen C Stark”. Can you please tell me more about this watch and what it might appraise for. 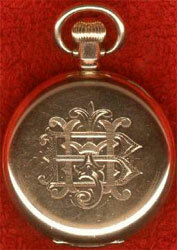 I ahve an old B&M Pocket watch thayt must be over 100 years old. 18 jewels. Serial number 61923. If you let me have your E-Mail I will send you photographs. I am considering to sale it Only defect it has is that the letters “Beaume et Mercier” are almost disapear, otherwise it is OK, functioning beautifly. Oops, I emailed you earlier and told you that my Great Grandmother had given me a watch and that she said it was won in a card game with Doc Holliday. My grandmother tells me I am mistaken and that she was told throughout her life that the card game was with Wyatt Earp, not Holliday. My father has a illinois watch company springfield 10k gold filled pocket watch. It is missing the the piece to wind the watch and it is missing the glass front cover and the numbers have somewhat faded. It still works though. I looked a couple of watches up and it has the same form of numbers to that of a 1923 watch. The back cover when you open it up says 10 KARAT GOLD FILLED, WADSWORTH QUALITY and a number 7470741. 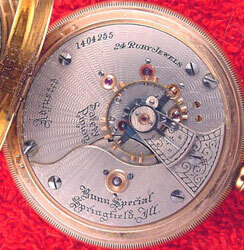 The inside where the mechanisms are it says ADJUSTED 3 POSITIONS, ILLINOIS WATCH CO. SPRINGFIELD, 21 JEWELS and a number 4880250. Do not know the year of this watch. Just would like to know if it is possibly worth anything. hello, i have a 1920 illinois open face pocket watch. the case is a solidarity 14k number 553944. the movement is a 5 position 21 jewel springfield extra. number 3650119. i have been searching for one to compare it to but i am unable to find one. any information you can give me about this pocket watch will be greatly appreciated. I have my Grandfather’s 40th Anniversary watch (1927). It is an open face Elgin – SN 29533242 in a Keystone Watch Case Co. case – SN 5455982, guaranteed 14K. There is a cover over the presentation engraving and his initials are engraved on the outside of this cover. Scratched on the inside of this cover is 4F4881 and what looks like 1/77/S. What can you tell me about it? Thank you. I have a Doxa pocket watch. The back of the watch has a design like horseshoes. I believe it is 80% silver as on the inside back cover it says 0800. on the inside back cover it says Medaille d’or Millan 1906, DOXA, hors concours, Liege – 1905. There is a ser. no on the inside ont on the works 607054. Can you tell me something about this watch. I have an elgin gold pocket watch with fahys monarch #1 524847 on it. It has roman numerals on face but no hands.Has engravings of a butterfly on one side and flowers on the other. It still ticks. Can you please tell me if it is worth any thing. I have been given a silver pocket watch from a great uncle. Must be at least 125 + years old. It is by a company called Steward. Number face rather than roman numerals. Second hand circle at bottom of watch. Back is engraved. Is this of vaue? 24,763,838. I have read an article saying this is an interesting piece. Can you tell me its worth. Hi. I have a classic eagle pocket watch and wanted to find information about it. The watch has the word “NETEC” and a train on the inside and has 60 little numbers indicating the seconds. Also it has an eagle on the outside cover. Somebody has information about the factory o mark “netec”. Thanks in advance. I have a 14ct QUALITE MONARD (Inscribed inside back case) also the inscription (written) Echappement a Ancre PIERRES it is also numbered. The condition I would not hesitate in saying 9 out of 10. There is no wear whatsoever on the case. It is winder type not key wound. Total weight 109 grammes. Can you give some idea of value please? ILLINOIS WATCH CO 285043. MEASURES 1 3/4 BY 2 3/4 INCH. hand is covering a letter so I will put a dash where this hand sets. The word is: H.J. Wo-onov I can’t open the watch because it is broken. Needs repaired. I have a waltham colonial royal I don’t now what size the cristel is.on the movement serial number is 24281166 it is 17 jewels A.W.W.CO. Waltham,Mass Royal Ajusted. the cristel was somehow broke if you could help on the size I have look every were for one and no luck thanks. I have a pocket watch, Moon, Trade mark A.L.D. Dennison watch case co– 925679 R.J.A lever, Joyce’s burnie, Swiss made. 10ct gold. I can’t seem to find one the same, is this very rare? Has been used but all together , I haven’t cleaned it, and it ticks great. Some ideas would be great. How do I find out what engraving on old pocket watch means? 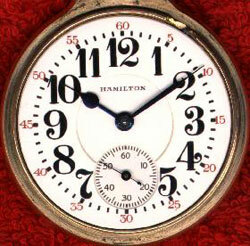 I HAVE A HAMILTON POCKET WATCH 950B I LOVE ARE THEY THE VERY BEST ??????? I came across a pocket watch that looks just like an Elgin 16 size. Instead of having the word Elgin on the movement , it says M. F. Akers in gold. There are also gold screws. Any clue if Elgin made this or who M. F. Akers is. I have a silver 3 hinge key winde and set pocket watch with Tourist on the dial. Inside the works say Waltham, Mass. with Tourist on opposite side of plate. Can you help me identify? I recently acquired a “Little Daisy” pocket watch. It has a serial number inside the back case. If someone could help me date this watch and a little history on it I would be most appreciative. I would like to know whether to keep it for display or to get it running. It is such a little beauty. “ ” Harold von Braunhut, who pushed X-Ray Spex and Sea-Monkeys, was the guru of comic-book mail order.